Dubai Didar has been announced for the last week of January 2018. Registraton starts on 8 January for resident only. Date is expected to be the last week of January. Verify first with your local council if you are going to travel from these above countries. In Canada even some residents were not allowed in Didar due to some crazy people making rules on who has the right to see his Imam. However you can make a point by going to Didar even if they do not let you attend, the Imam will know that you tried. Meaning of Darbar and why all murids must be encouraged to go for Deedar and never be refused to pay homage or participate in the most significant religious and a holy congregation for all Ismaili Muslims. “What is a Darbar - A Darbar is when Imam declares that a Deedar, is also a Darbar. Imam has explained a Darbar as follows. This was during a religious Deedar. Therefore, a Darbar is not a Deedar, but it is an additional part of a Deedar for rejoicing. This is what Hazar Imam said regarding a Darbar. “ Today I want you to share in My happiness. And this is why I decided that today should be an occasion of Darbar. A Darbar is an occasion of special happiness, of special meaning, and I want My Jamat at the beginning of this Farman, to know how very happy I have been during this visit to the United Kingdom. And that is why I made the decision that today should be a Darbar, a day of special happiness, special rejoicing, for you and for Me. “London, UK August 14th, 1994. Link to meaning and significance of Deedar..
Mawlana Hazar Imam arrives on Monday January 22. Jamati Work (Madhan Chanta and Bol) will be held Tuesday January 23 and Wednesday January 24 at the Ismaili Centre, Dubai. Darbar will be held on January 25 at DWC. We have 1,500 volunteers in Dubai for this Didar, including Volunteers from other Jamats. 2018, January 23 - Dubai, UAE - Mowlana Hazar Imam has graciously started to give Didar to groups of Ismaili Murids at the Ismaili Centre today. The series of group Didars will culminate on 25th January by a grand Darbar in commemoration of his Diamond Jubilee. 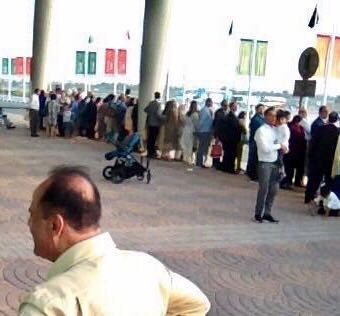 The Jamat from across the Gulf gathered in Dubai earlier today as Mawlana Hazar Imam graced them with a Diamond Jubilee Darbar at Dubai World Central. UAE National Council President Amiruddin Thanawalla presented a loyalty address to Mawlana Hazar Imam on behalf of the Jamat of the United Arab Emirates jurisdiction. A gift of a manuscript of the kulliyat (collected works) of Muslih al-Din Sa’di was also presented to Hazar Imam. Muslih al-Din Sa’di was a 13th-century Persian poet and prose writer who was widely recognised as one of the greatest masters of the classical literary tradition. The manuscript was specially copied for 46th Imam Mawlana Hasan Ali Shah and was completed in January 1818, exactly 200 years ago. Mawlana Hazar Imam expressed happiness over his visit to the UAE and conveyed blessings to the jurisdiction as well as global Jamat. Posted: Mon Jan 29, 2018 10:39 am Post subject: Mubaraki! A plethora of mubarakis on beloved Hazar Imam's (recently concluded) Padhramni to the UAE. Mashallah, from all testimonial accounts, this was indeed a monumental visit. I particularly enjoyed reading about how the Imam made sure the jamat was included in the nazrana presented to the Imam during the Darbar. The esteemed leadership does not bother about the jamat, but Imam knows how much the jamat loves to be part of the nazrana. After all, under the current leadership regime, it is impossible for any murid to send a personal nazrana to his/her Imam (physically). Alas! Gone are the days of Diwan Sir Eboo who would accept nazranas from individual ordinary jamati members and make sure the Imam received them as all these murids would then receive a written acknowledgement signed by Hazar Imam, full of dua ashish and blessings, which became treasured lifelong souvenirs nay heirlooms. So it was very touching to read about how beloved Hazar Imam insisted in the Dubai Darbar that the jamat should be made aware of the nazrana presented to Him and its antecedents. Once again, I say Mashallah! I hope other jamats will make note of this because this question will be repeated by the Imam in other Darbars. I was also pleased to learn that in Pakistan and in the UAE Mukhisaheb asked beloved Hazar Imam to give more blessings when Imam asked them if there was anything else. At least there was no recurrence of the indiscretion that occurred in Canada and the result was that the jamat received more blessings!!! The Darbars are under the absolute control of the Mukhi Kamadia Sahebs. The LIF, the Councils, etc have no jurisdiction during the Darbar. I therefore feel sad that so far I have not come across a single Mukhi saheb whom I would be openly able to call a "real leader", a leader worthy of salutation and respect. I say this because, in my humble opinion, I feel that the current situation is actually a test upon the Mukhisahebs. When Mowlana Hazar Imam asks Mukhisaheb in the Darbar if there is anything else, is there not a single brave, fearless, compassionate Mukhisaheb who can tell beloved Hazar Imam - the giver of abundant mercies and bounties - about the few visiting murids, brothers and sisters, waiting outside the Darbar Hall for His blessings and deedar? Is there not a single Mukhisaheb who can request beloved Hazar Imam to allow these murids into the Darbar Hall? Or if that is not possible, to request Imam to give special blessings for them? So far, all Mukhisahebs have failed this test because they have forgotten that in a Darbar, they are absolutely in charge. I pray, with all my heart, that in future Darbars there will at least emerge one Mukhisaheb who will not have the fear of never being appointed again, who will have a heart full of compassion and who will speak to the Imam about the murids barred from entry, knowing that the Imam is an ocean of mercy, compassion, generosity, kindness and love. Ameen, ameen, ameen. 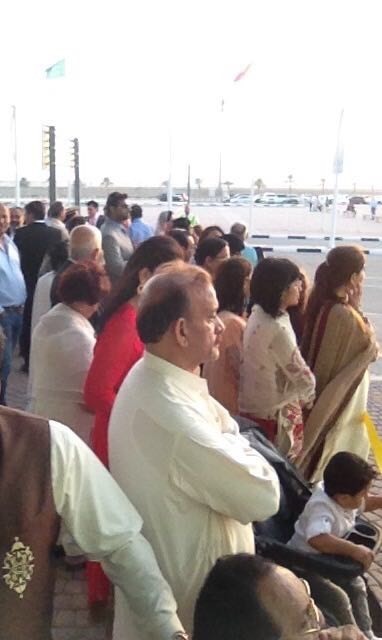 After all, look at this photograph taken outside the Darbar Hall in Dubai at the DWC. These, fewer than 200 murids, were not allowed entry even though the Darbar Hall had more than enough space even to accommodate as many as 3000 extra people. Many of these were aged murids in wheelchairs! Truly sad. To add insult to the injury, they were asked to come early to the DWC and it was intimated strongly that they would be permitted entry. Many of these murids, especially the senior citizens, arrived hours early. Alas! Entry was never permitted. To add further insult to the injury, these murids were then allocated the above space outside the Darbar Hall by the volunteers who promised them that Hazar Imam's motorcade would be led through that area after the Darbar, at a slow pace. This was at least something to look forward to after a long, tiring and trying day full of rollercoaster emotions. Alas! This also did not happen and the Imam's motorcade left the darbar site from an entirely different route. My prayer is that such atrocities be stopped during such happy occasions. Do not give murids from outside false hope and false promises. That is not fair at all and not in the spirit of Islamic brotherhood and unity. All visiting murids should have been immediately told that as the LIF announcement clearly stated that murids should not travel with the expectation of participating they should not come at all to the DWC as they would not be permitted entry and would not be able to catch a single glimpse of even the Imam's car, let alone the Imam Himself. That would have been infinitely better than giving false promises and false hope, and actually lying also. Of course, after the Darbar, the UAE jamat was very kind and forthcoming and all the visitors were cordially invited to partake of the refreshments, dinner and enjoy the entertainment. How ironic though. There was genuine hospitality after the Darbar but not a single spot of compassion during the time which mattered most! This Diamond Jubilee is a real eye-opener. Incredible to think that up to 2011, there was unity, brotherhood, generosity, flexibility, all underlined by the principle of mercy. And then from 2012, it all changed to stentorian dictates right up to downright cruelty and atrocity.